Flapping but unflappable, the St. Joseph’s Hawk urges the crowd on. Over a 63-year history, the Hawk has been named the nation’s top mascot by Sports Illustrated and ESPN and been nominated to the Mascot Hall of Fame. As the pregame din fades to a murmur in Hagan Arena, tradition stands 6 feet tall, an unblinking flurry of feathers at center court. The fans remove their hats. "The Star-Spangled Banner” begins. With one wing over his heart, the St. Joseph’s Hawk pumps the other up, down, up, down. He doesn’t stop flapping. Not for timeouts, player injuries, posing for photos, or personal exhaustion. Not even for the national anthem. “People have asked, ‘How do you keep it going?’ and, at first, you’re just more afraid to stop flapping than anything. That keeps it going. It motivates you in a way,” said Domenic Godshall, the man behind the beak of one of the most decorated mascots in college sports. 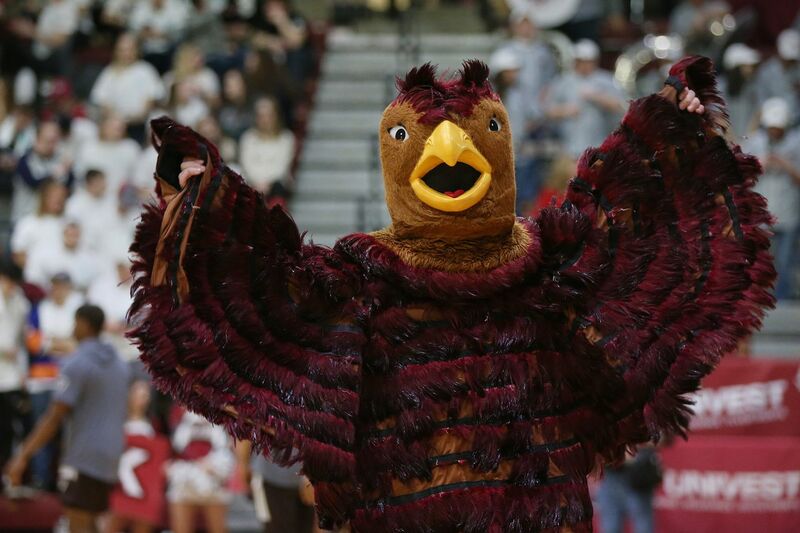 The unflappable sixth man on the St. Joe’s court, the Hawk travels to every game with the men’s NCAA Division I basketball team, beating his wings continuously between jumping jacks and figure-eight sprints. The feather-filled endurance sport is a testament to the St. Joe’s slogan, “The Hawk Will Never Die." One of the only college mascots to travel with the team and receive a full-tuition scholarship for the role, the bird has star power. Over its 63-year history, the Hawk has been named the nation’s top mascot by Sports Illustrated and ESPN and was nominated in 2008 for the Mascot Hall of Fame. “The Hawk is iconic, he keeps the school together," said freshman Liam Majewski after posing for a photo with the anthropomorphic avian in the stands. With a tepid 13-16 record heading into the final week of the regular season, the Big 5 team may struggle to find footing come Selection Sunday. But no matter what happens, the pride of St. Joe’s forges on. “Obviously there’s games where you’re down 30 or you’re up 30, and the constant of St. Joe’s is ‘the Hawk will never die,’ regardless, and you keep flapping away no matter what,” Godshall said. As one reader inquired via Curious Philly — the forum where you can ask our journalists questions — the Hawk dates back to 1929, when the then-yearbook editor established a student contest for a symbol. Narrowly beating out the World War I-themed “Grenadiers,” the “Hawks” won. While the school’s football program folded after the 1939 season, the Hawk has withstood the test of time. After the idea of releasing an actual bird onto the court failed to take flight, the hawk-in-motion mascot tradition began with student Jim Brennan. In a $120 hawk suit fashioned at a Center City burlesque club, Brennan first donned the winged persona on Jan. 4, 1956. The night ended in a 69-56 win over La Salle at the Palestra, and the Hawk hasn’t missed a men’s game since. Sixty-three years later, Godshall is the 39th student to embody the Hawk. Unlike other Hawks who lifted weights to prepare for the endless flapping, Godshall, a senior from Lititz, Pa., also in his fourth year of managing the team, credits cardio for the spring in his wing. Per game, that’s about 6,100 flaps, including timeouts and halftime, says Godshall. Over the 31 regular-season games, he’ll do about 189,100 arm flaps — playoffs, charity events, and weddings not included. With all that team inspiration comes serious perspiration. The suit is cleaned professionally annually, but in between games, Godshall said, he douses the costume with gear spray usually used for hockey or lacrosse pads. “It doesn’t smell too bad,” he said. We took his word for it. Domenic Godshall, a senior from Lititz, Pa., who is also team manager, prepares to take wing. While Godshall has gone through the 2018-19 season relatively unscathed, the Hawk is no stranger to fowl play. In 1995, the mascot traded punches with crosstown rival the Temple Owl before cheerleaders and security guards swooped in to break up the feathery fray. In 1998, things got ugly between the Hawk and the Rhode Island Ram as Rhody tried to pin the predator’s wings, ending in a dismantled hawk head and a warning from the ref. The St. Joseph's Hawk in his usual corner spot on the home court at Hagan Arena. Whether the team is leading by 30 points or down by 30, the Hawk keeps flapping. For Godshall, the rules are simple: Stay away from the wings, and no one gets hurt.